The Bonnie Blue Flag, a rectangular blue field with a single five-pointed star in the center, is the familiar name of a flag that dates from 16 Sept. 1810, when it was used by the short-lived Republic of West Florida. The flag was also the flag of the Republic of Texas for three years and of the Republic of Mississippi before it became a part of the Confederacy. Although never approved by the Confederate Congress, it was adopted by the southern people and flew as the national flag in North Carolina during the time of the Confederacy. The Bonnie Blue Flag is also referred to as the flag of secession, as it was used before the Civil War by citizens who believed in secession. 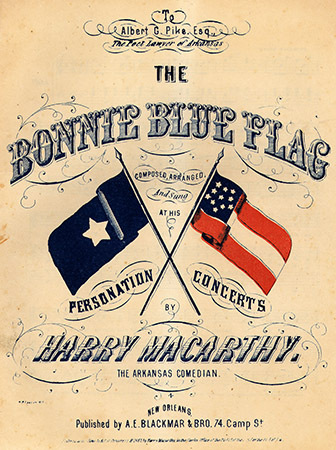 In 1861 Harry Macarthy wrote "The Bonnie Blue Flag," a song that he performed before a packed house in New Orleans. The crowd loved the song, and its popularity quickly spread across the South. It became the Confederate soldiers' favorite marching song. After the war, anyone singing it in the occupied South was subject to arrest.